Hair Transplants have been developed and pioneered by Dermatologists from the beginning. Dermatology is the medical specialty of the Dermis (hair and skin). Dermatology training is one of the most comprehensive and oldest specialties of medicine. Here is a brief overview of some major names you may recognize in the history of hair restoration as a treatment for male pattern baldness. Dr. Orentreich – Board Certified Dermatologist who completed the first hair transplant surgery in New York in the 1950s. Dr. Unger – Board Certified Dermatologist who trained with Dr. Orentreich and defined the safe zone technique for harvesting hair graft implants. Dr. Norwood – Board Certified Dermatologist and creator of the Norwood scale of men’s hair loss you commonly see for grading hair loss. Dr. L. Lee Bosley – Board Certified Dermatologist and founder of the micrograft process. Dr. Limmer – Board Certified Dermatologist who introduced the stereo microscope technique for cutting micro-grafts out of a strip surgery harvest. Dr. Inaba – Dermatologist who first introduced Follicular Unit Extraction that was then made mainstream by, among others, the Dermatologists Dr. Bernstein and Dr. Woods. Every year more and more innovations in hair restoration are developed. The contributing specialties vary from across the board in the medical field in a large team effort to improve patient care and results. Now, all Houston transplant patients can access the decades of research and knowledge on graft implants. One day, we may even see the next step in restoration develop via hair cloning and graft multiplication. 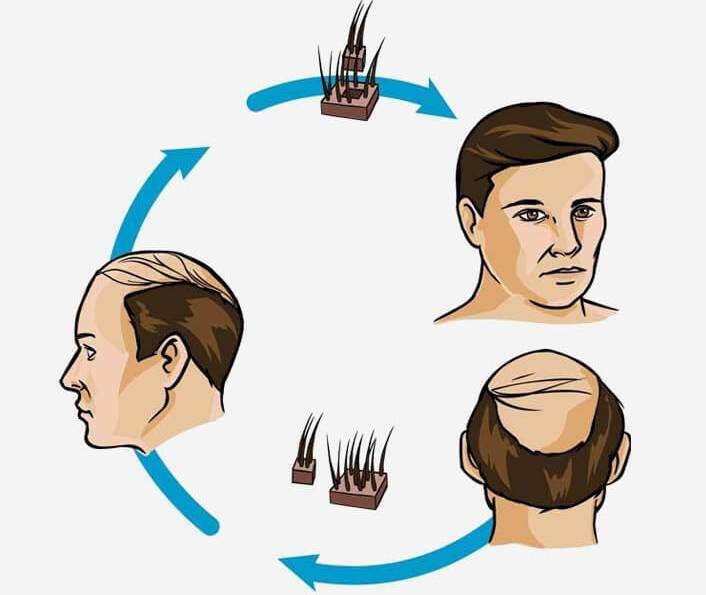 This was a revolutionary time in hair restoration with exponential advances in resolving men’s hair thinning. In particular, the decade started with motorized devices made FUE more common and available to more patients. Finally, computer guided FUE was introduced in the past few years to dramatically surpass prior FUE technology. It is also important to recognize the contributions of other specialties in medicine to the field of hair restoration. For example, plastic surgeons, and other dedicated hair transplant specialists have played pivotal roles in restoration history. As an example, one well-known plastic surgeon who does hair transplants is Dr. Alfonso Barrera who is right here in Houston. We always encourage patients to ask the hair restoration doctor about the exact background of their training. Sure they can say I am a hair transplant surgeon, but what is the exact training and degree of specialty. Now, of course, we are not saying that other specialties cannot do a good job. We are sure they can. We simply want patients to be aware of the history and facts when making a decision on choosing a hair transplant surgeon. If you are in Louisiana, San Antonio, Austin, Dallas, or beyond, you can have access to the highly skilled team at the Dr. Jezic’s Center with just a short trip. Once this initial step is completed in the due diligence of researching a hair restoration center, the next thing to consider is if you want FUT or FUE. We believe both produce good results. The main question is the side effects and healing when comparing FUT vs FUE. If you prefer one method to the other, you can then choose to go to a center that does both or you can go to a dedicated FUE center or a dedicated FUT center. Here the matter depends on your comfort level in having a specialized center complete your surgical procedure. And the great news is, we have just such a center right here in Houston, Texas. Please note the Dr. Jezic’s Center is directed by Dr. Jezic. We have no affiliation with any of the other clinics or physicians on this website. We do not take an opinion, or make recommendations on any other clinic or physician. We do encourage all patients to do thorough research on the clinic and doctor they select.